CALGARY – New research from a Canadian pro-life organization shows that public support for abortion decreases measurably if people are shown images of abortion victims. Whether or not opponents of abortion should disseminate images of abortion victims is an ongoing debate within the pro-life community. While some argue that doing so in an important and effective means of persuasion, others contend that the images—which often feature bloody, mangled babies—are too graphic and unpleasant. Now new research suggests that people are in fact prone to change their minds about abortion after viewing images of aborted infants. The study was commissioned by the Canadian Centre for Bio-Ethical Reform (CCBR). To collect data for the report, the group surveyed specific geographic areas, asking respondents about their opinions on abortion. 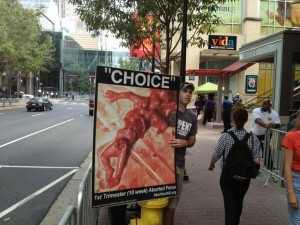 After the survey, the group distributed postcards showing images of abortion victims. Then, following the postcard distribution, CCBR again surveyed the respondents’ views on abortion to see if their views on abortion had been affected by the postcards. Support for abortion dropped measurably after people viewed the postcards. “By canvassing thousands across several neighbourhoods and surveying 1,741 diverse respondents, results found a statistically significant shift in pro-life worldview, a greater negative perception of abortion, a decreased degree of permissiveness and liberalism towards abortion law, and a significant gain in pro-life political views after seeing abortion victim imagery,” the report states. Based on these findings, distributing images of abortion victims appears to be an effective way to further the pro-life cause. “This still suggests, nonetheless, that abortion victim imagery in itself, regardless of presentation, is intrinsically effective at altering previously positive perceptions on abortion and changing the culture,” the report states. However, last week’s report suggests that when people see pictorial evidence of the graphic nature of abortions, they often change their minds about abortion. “The study confirms what pro-lifers have witnessed for decades: seeing abortion victims alters how individuals feel about abortion—which in turn influences how they think about abortion, including their political views,” noted Mark Harrington, National Director of the pro-life group Created Equal, in a statement.